Finally some good news about being a senior comes from these University of Arizona researchers. Lifelong cytomegalovirus infection may boost the immune system in old age, when we need it most, according to a study led by University of Arizona researchers. Our immune system is at its peak when we’re young, but after a certain age, it declines and it becomes more difficult for our bodies to fight off new infections. “That’s why older people are more susceptible to infections than younger people,” explained Dr. Janko Nikolich-Žugich, co-director of the University of Arizona Center on Aging and chairman of the Department of Immunobiology at the UA College of Medicine – Tucson. I hope this will be helpful to you. Seems the entire country is under attack by the flu. When I was only concerned about weight loss, I learned that diet was bout 75 percent of the battle. Seems the same for the immune system. too. Chicken soup helps, sure, but a diet rich in vegetables, fish and even garlic can help lessen the severity of a cold or prevent you from getting sick. The combination of chicken, homemade broth, veggies (such as carrots, celery and onions) and noodles or rice in chicken soup is immune-boosting and soothing, and the warm broth clears your nasal passages and keeps you hydrated. Winter doesn’t just bring the blues, it also gifts us with coughs, runny noses and sore throats. It’s not because of the old adage of bundling up or “you’ll catch a cold!” We tend to get more cold and flu viruses during the winter as germs survive longer indoors due to poor ventilation and lack of humidity, and we are stuck indoors for much longer during the frigid months. As if the current bone-chilling cold snap (can you say Polar Vortex?) weren’t enough to worry about six days into the new year, flu outbreaks have spiked in the latest week, according to the Centers for Disease Control (CDC). Unfortunately for those of us affected by the cold, it aggravates the situation. As we huddle together to keep warm, we help to spread the virus, according to Dr. Manny Alvarez on Fox News. In addition, “the immune system in your body doesn’t work properly when you have temperatures below zero,” also “viruses love the cold and wet,” he concluded. Some 25 states are now reporting widespread flu outbreaks. This is a jump of 10 from the previous week. So far, two children died as a result of flu this week. The total now stands at six flu-associated pediatric deaths. Click on map for enlarged view. It appears that the current virulent strain is striking the young and middle-aged very hard. Despite the apparent lateness in the season, doctors say it is still not too late to get your flu shot. Doctors report that it reduces your risk of catching the flu by 70 percent. 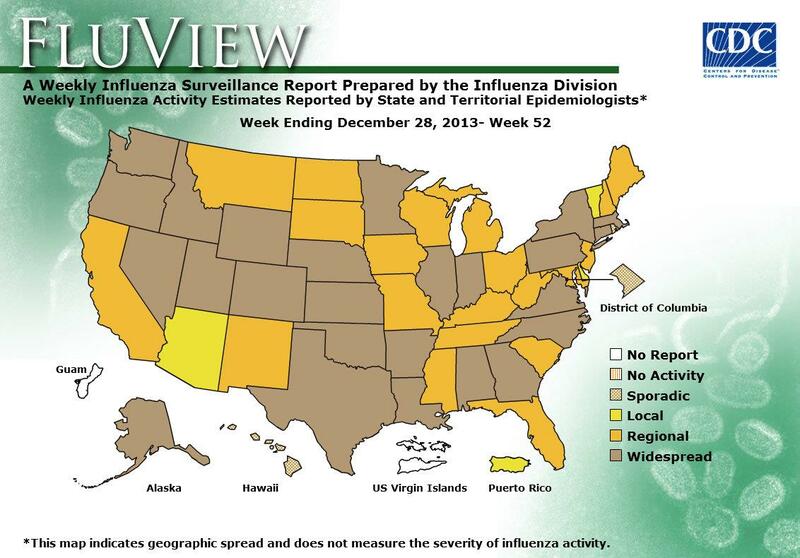 The map displays the widespread nature of the flu till December 28, the latest graphic data available. I have written repeatedly about combating the flu. You can read details on my Page – How to fight the flu. Cover sneezes and coughs with tissue or crook of elbow, not hands. Drink plenty of fluids, but not alcohol.